New Delhi [India] : Rashtriya Janata Dal ( RJD) Chief Lalu Prasad Yadav's daughter Misa Bharti finally made an appearance before the Income Tax department here on Wednesday, in connection with the charges against her on ownership of benami properties. Bharti took part in the investigation at the Jhandewalan office, where she was present for around an hour, between 11.30am and 12.30pm. 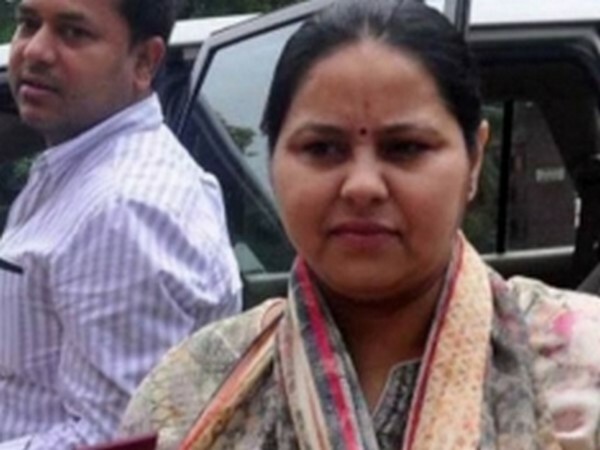 On Tuesday, the I-T department attached a total of 12 plots of Misa Bharti and her husband Shailesh Kumar, Deputy Chief Minister Tejaswi Yadav and ex chief minister Rabri Devi, and sisters Ragini and Chanda Yadav. One farmhouse in Delhi and one bungalow in New Friends Colony are also attached. The market value of the total attached property is worth Rs. 175 crore, whereas the book value of the attached property is Rs. 9.32 crore. 1. Farm no: 26, Palam Farms, Bijvasan, Delhi. Benamidars: Mishail Packers and Printers Pvt. Ltd.
Benamidars: AB Exports Pvt. Ltd.
Benamidars: Delight Marketing Pvt. Ltd. The I-T department had earlier seized Benami properties of Misa Bharti, Shailesh Kumar and Tejashwi Yadav. Two summons to Misa were also issued, but after she failed to appear, the I-T department proceeded to seize the properties which were raided in May. On June 13, the I-T Department summoned Shailesh Kumar, in connection with the benami assets and tax evasion case registered against him. On June 7, the I-T department slapped a fine of Rs. 10,000 against Shailesh on account of not appearing for interrogation. Earlier, Misa Bharti and her husband Shailesh were summoned by the I-T department in connection with a 'benami' assets case. The summons were issued days after the arrest of Bharti's Chartered Accountant (CA) Rakesh Agrawal, in connection with an Enforcement Directorate probe into a Rs. 8,000 crore money laundering racket, involving two Delhi-based businessmen and a few political entities. Agrawal was arrested under provisions of the Prevention of Money Laundering Act ( PMLA) for allegedly being instrumental in providing accommodation entries (illegal funds) to launder the money of businessmen brothers - Virendra Jain and Surendra Jain. The I-T department in its summons reportedly said it wishes to question Misa and her husband on transactions conducted by M/s Mishail Packers and Printers Private Limited. The I-T department had conducted raids and surveys at about 22 locations in Delhi and adjoining areas in connection with alleged benami deals of Rs 1,000 crore by Lalu's family.